Obsession is a tricky word. Any bibliophile can sense it coming, when they read a new dealer description or see that perfect binding. We’re using the word in our upcoming exhibit, entitled Magnificent Obsessions, in honor of the Smithsonian Libraries 50th anniversary , to describe the incredible collections built by private individuals and donated to the institution. The passion and sweat equity put into building these collections lives on as researchers and fellows study the material in its new home. One donation highlighted in the exhibit is that of Bern Dibner, whose donation of 11,000 printed books and 1,600 manuscript groups became the foundation of the Smithsonian Libraries’ Dibner Library. Working at the Dibner, where every book is a tinderbox, ready to spark a spiraling inquiry lasting far longer than ever intended, one learns to tread carefully in the vault. 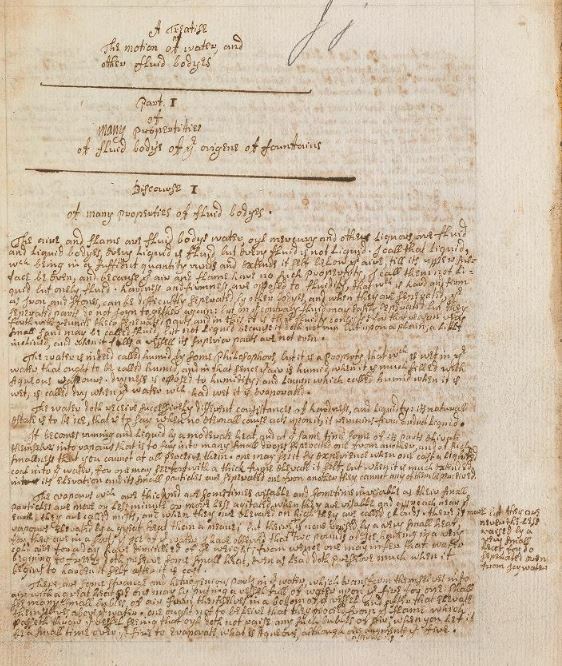 The first page of the manuscript., showing a small neat hand that is unchanged throughout the text. Fully digitized. Of the 35,000 rare books in this library, one volume managed to break through my defenses, launching a bibliographical investigation now in its second year. While writing a description of A treatise of the motion of water and other fluid bodyes for the Smithsonian Transcription Center, I stumbled upon a discrepancy in a reference book. Now, more than a year later, with some preliminary ideas confirmed, I present here some initial findings. 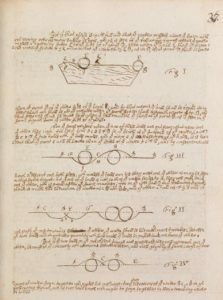 The book is an illustrated manuscript containing an English translation of a French work by Edmé Mariotte (1620-1684), a French physicist and priest, on hydrodynamics. 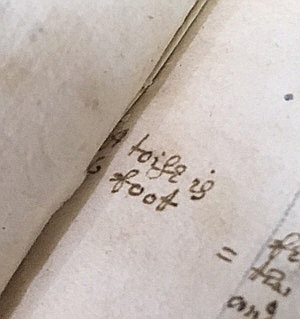 While the catalog record notes that the manuscript is from 1690, the date is based solely on information from the book’s previous box that unfortunately no longer exists. As the first known English translation of the Mariotte treatise was printed in 1718, this manuscript, if the 1690 date is correct, precedes that edition by almost thirty years! Was this a draft of that printed version? If so, why wait so long to put it to press? And if not, why reproduce by hand an entire printed book? And, perhaps most essentially, can the 1690 creation date be verified? After several months of research, I had a plan to solve the mystery of this manuscript. Using a three-pronged ‘attack’, a 17th century creation date could be verified! Above: The same diagram from the manuscript, first edition (1686) and second edition (1700). The 1700 clearly has a B labeling the bottom right corner while the manuscript and 1686 do not. Below: In the gutter of the manuscript is nearly hidden one of the only instances where the author’s own voice is found. A toise was a pre-revolutionary France measurement and equaled 6 feet. First, a bibliographic investigation. I compared the 1718 English edition and the 1686/1700/1718 French editions with the manuscript to determine what connections exist. The similarities and differences should illuminate a likely base text of the manuscript. Had the manuscript been in French, the original language of the work, establishing the source text would be easier. Thankfully, there is a universal language that exists across all versions of this work: mathematics. A comparison of the many diagrams littered throughout the text allowed me to identify the slight differences that could point to the manuscript’s source. Second, an investigation into the physical evidence. Any notes in the writer’s voice, bookplates or other provenance, watermarks in the paper, and the binding were all considered to help pinpoint where and when this text was written. Third, a subject-oriented inquiry on the content. Why would somebody translate and hand-write an entire book on hydrodynamics? Did this practice continue after a printed text was available? Was hydrodynamics particularly popular at any point in time? My obsession with verifying the 1690 creation date continues unabated. With every new piece of data collected, verification becomes an ever more attainable goal. Finding that the wording of the 1718 English printed translation is consistently different from the manuscript translation, I can say with certainty that the English manuscript is unique with no direct ties to the English printed edition. The only diagrams in the manuscript labeled with figure numbers because they were mistakenly drawn out of order. 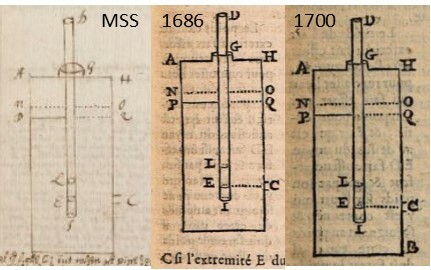 A comparison of the diagrams uncovered over 30 discrepancies between the manuscript and the three printed French editions. In some cases, the printed version was missing a diagram that was present in the manuscript. In other cases, the printed version omitted a letter indicator that was included in the other editions and the manuscript. (See example below.) Using this data, I could identify the 1686 first French edition as the base text! Of course, this doesn’t mean the manuscript was written exactly in that year, but it does allow for the possibility of a 17th century creation date. The Arms of Amsterdam watermark, identified by the three Xs in the center of the shield. The initials H G can be clearly seen below. to the Angoumois region of France as the region of manufacture. Because of its quality, this paper was exported to both the Netherlands and England, though political turmoil and edicts that disrupted the European industry helps further limit when and where it may have been sold. Fortunately, I unearthed two similar (perhaps identical!) 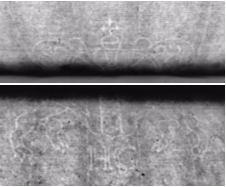 watermarks in the Folger and Bodleian collections that have dates attached. More investigation is needed before final conclusions can be drawn, though it is encouraging that both are dated in the latter half of the 17th century with origins in England and the Netherlands. A bookplate from the Mylne family, known for their large water projects in Edinburgh, is a promising avenue. It may help understand who wrote this unique manuscript translation of Mariotte’s book, and why . Investigations into the Mylne family library, whether there were many hydrodynamics manuscripts or whether they owned a copy of the French 1686 edition, could be telling. Re-creating the Mylne family library digitally could be possible by collecting information from institutions worldwide about their holdings with Mylne bookplates; a project for another day. 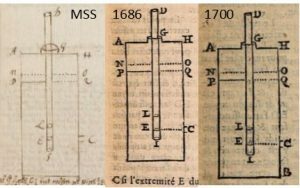 Further investigations into hydrodynamics, an exciting field that saw many new developments in the mid-17th – mid-18th century, is needed, as is a deeper delve into the physical binding evidence (which so far points to an English late 17th century style binding). 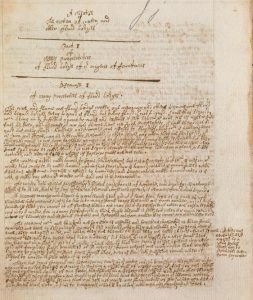 At this time, my research into the bibliographic evidence, physical evidence, and content of the manuscript supports the 1690 creation date. The work to unravel the manuscript’s mystery and, ideally, cure the obsession, is unfinished. With promising preliminary results, however, there is plenty of motivation to continue the work as long as it takes.